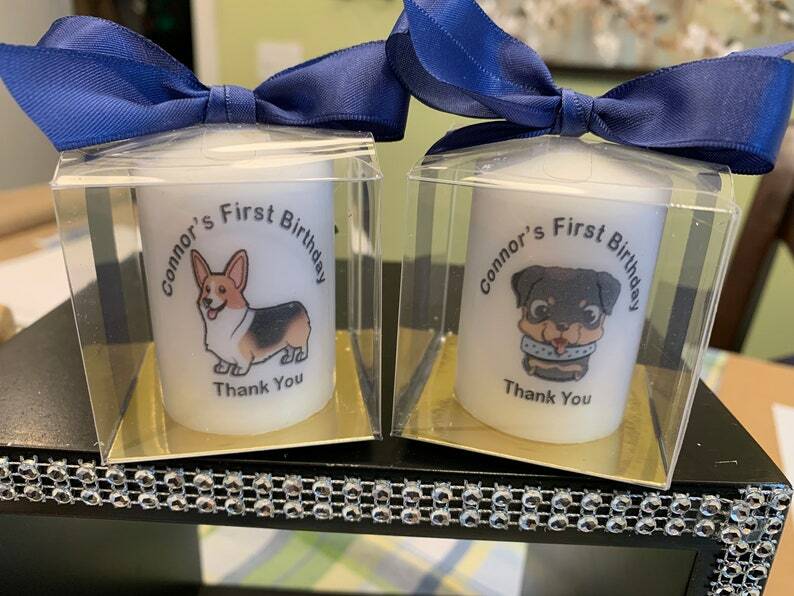 You are getting a beautifully boxed and personalized party favor votive candle! Any image can be melted onto these votive candles to match your party theme ! Send us a picture of your invitation and we can match it ! Each 2 inch votive has a hand burned on image, boxed in a clear 2x2x2 box, based placed in each box to secure the candles in place (tan, gold or silver) wrapped in the bow color of choice and finished with a custom card stock card attached to the top of each favor ! Please message me with questions , we are more than happy to answer questions to make sure your favors are perfect for any occasion ! These are absolutely adorable! Thank you! Quick turn around. I like that the ribbon can fit 3 rows of writing. The ribbons become stringing on the ends where it’s cut. This is my first time ordering these ribbons, but I think this is normal. Would order again. We pride ourselves in shipping within 1-2 business days after payment received. Mail usually takes 2-4 days.